There flows a holy river krisna near the Vyom stambh mountain in the south of India to the south of which lies a village named KHAMBAMA KANKARABARA, that village was blessed with birth of the sage ANGIRA, son Brahma the first incarnation of God, who performed a Great Yajna (mahayagn) called AGYARASA. In this noble family was born Sri YAJNA NARAIN BHATTA, like Lord Brahma and Lord Narayan, the performer of some Yajna(som-yagna). 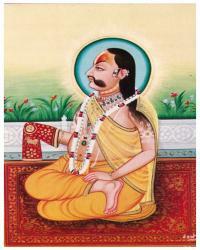 Highly well-versed in the knowledge of all the Vedas as he was , he is acknowledged as the Vedas incarnate(Vedavatar). He appeared approximately around 1400 Vikram era. Sri Yajna Narain was initiated into Gopal Matra , a spiritual Formula by Guru Visnu Cit Muni of the Visnu Swami Sect, who delivered to Sri Yajna Narain ji, the deity , Lord Sri Madan Mohan Ji. Sri yajna Narain commenced the divine service of Sri Madan Mohan Prabhu(LORD).Sri Yajna Narain Performed one Soma Yajnas (SOMA Yagna).When he was absorbed in contemplation of the lord Yajna ,in soma yajagni, that very moment ,Lord Sri Madan MOhanji, the Yajna purus appeared , Sri Yajna Narain was extremely ecstatic to have the glimpse of Lord Sri Madan Mohan Lal ji and began to sing his praise multifariously, “O God of gods ! Thy praise has been sung by Vedas and Puranas. Nobody can gauge Thy mysterious ways. I salute thee in reverence. Thus he deeply eulogized Him. Then spoke the Lord. “O Brahman Sage ! ask for Boon and fructify my glimpse.” Thereupon Diksit Yajna Narain humbly submitted : O Lord ! What greater boon is there for Thy devotees adoring Thy lotus –feet than Thy face – to – face divine sight? Thus he was choked with emotion while portraying with utmost rapture the Lord. The Lord Sri Madan Mohanji thus spoke : You are inundated with piety. I shall incarnate in your clan after a hundred Yajnas have been performed therein for projecting your fame and for the sake of deliverance of the devotees. Saying so that Lord vanished from under the pavilion(mandap) erected for Yajna. Sri Gangadhar, the son of Yajna Narain performed twenty seven SOMA YAJNAS and served his adorable Lord Sri Madan Mohanji. 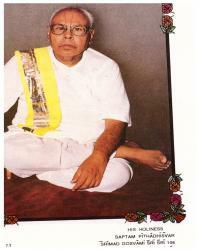 Sri Sri 108 Ghanshyamlal Ji , the present Head of this seventh Holy seat remains , round the clock , engrossed in the divine service of the deity ,Sri Madan Mohan Prabhu and perpetually performs his various religious ceremonies and celebrations with a view to efficient management ,His Hpliness , Sri Ghansyam Lal Ji Maharaj has set up a trust with the appellation of the “The Seventh Seat Sri Madan Mohan Ji Pustimargiya haveli Trust” , which has been registered on the 8th August , 1977.